Mobile scaffold tower hire continues to be one of the most popular options for people working at height. For a reasonable price, you can secure peace of mind and security when carrying out tasks at height. Using a mobile scaffold tower gives you ultimate flexibility and versatility, whether you are a professional working on a construction site or you are a domestic user undertaking jobs around the home. A mobile scaffold tower allows you the freedom to complete both indoor and outdoor jobs at a wide range of heights and locations while offering you ultimate safety and security. The lightweight aluminium towers are mobile and adjustable, making it easy to transport and manoeuvre even in tight spots. At Lakeside Hire, each piece of kit is maintained to PASMA guidelines, inspected, checked and cleaned before it is sent to you ensuring that you will receive excellent quality, scaffolding in tip top condition. 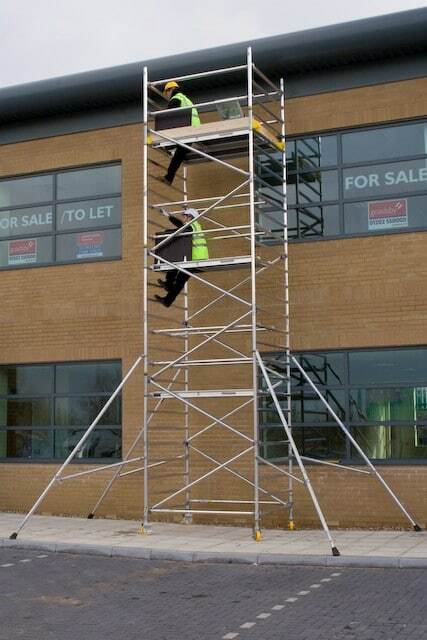 If you hire a Mobile scaffold tower it can prove to be a cost-effective alternative over traditional scaffolding if you are undertaking a one-off job. Lakeside Hire is customer focused and dedicated to offering top quality equipment at the very best prices. The ethos is that good value and quality will speak for itself so Lakeside Hire does not pay a full time sales team. It also means you will not receive irritating unsolicited sales calls. Scaffold tower is so simple to assemble, it comes with an easy-to-follow user guide and you don’t need any special tools or equipment to erect the towers. It is so straight-forward, even if you have never put together a mobile scaffold tower before, the scaffold tower can be assembled between 30 minutes and an hour. Mobile scaffold towers may not allow a contractor to reach the same height as those using a standard scaffold tower but it does offer mobility and convenience because it can be used for so many different tasks. And the best bit about mobile scaffold towers is that it does what it says on the tin. You don’t need to waste time dismantling and re-assembling the tower every time you need to move it making it a practical option when it comes to saving energy and effort on site. Many mobile scaffold towers also boast a special folding mechanism which means the tower will take up less space while it is in use. The tower has a variety of special safety features. It has smooth rolling, locking wheels, guard rails and locking mechanisms for all the moving parts. It even has a patented colour coded brace hook for a secure grip. That means you will know when it is put together correctly. Other features include a system of integral ladders built into the end frames for safe access, ribbed tubing for non-slip grip and a rugged stabiliser for outstanding rigidity. A mobile scaffold tower is also perfect if you need to do jobs around the home. Inspecting your roof, cleaning the gutters or even cleaning the highest windows can be a daunting task but with a mobile scaffold tower you can complete all of these jobs is total safety. Reports from the HSE show that falls are the biggest cause of death and injury so don’t take the risk and become another statistic; choose the safe option when working at height.